Matthew says "behold" to make sure he has our attention. He knows how prone we are to fall asleep while we're reading. "Wake up. Make sure you're listening. This is huge. Don't miss it. It's not what you'd expect..."
But what's so shocking about magi coming to Jesus? We might be so used to this annual Christmas story that we're not surprised, like Matthew wants us to be, that magi came to Jesus. Don't they come every Christmas? We should we be surprised. Because magi is an ancient word referring to pagan astrologers. And since they dabble in the dark arts, we eventually got our English word magic from such magi. "Behold," Matthew says. "Look at this: Astrologers are coming! Pagan sorcerers are searching for Jesus! Wizards want to worship! Behold! This is shocking—and spectacular!" Now "We Three Kings" is a wonderful Christmas song. Perhaps the Beach Boys' version is best, if that's not too sacrilegious to say. I'm not eager to play the spoiler here, but these dudes aren't kings. They are pagan astrologers, not too far from what we'd call sorcerers and wizards. Gandalf and Dumbledore are coming to worship the baby Jesus. These magi are not respected kings but pagan specialists in the supernatural, experts in astrology, magic, and divination, blatant violators of Old Testament law — and they are coming to worship Jesus. We really should beware of having a narrower vision of who can come to Jesus than God does. We can be so prone to write off people like this, but God doesn't. He draws. He woos. He's seeking worshipers from among the priestly caste of pagan religion. There will be worshipers from Hogwarts, even from Slytherin. And God is drawing them to his Son even though the Old Testament clearly condemns their vocation. These magi are "the magicians, the enchanters, the sorcerers, and the Chaldeans" that the king of wicked Babylon commanded to tell him his dreams in Daniel 2:2. Moses had so clearly condemned the use of such magic in Deuteronomy 18:9–14. And prophets Isaiah (47:11-15) and Jeremiah (10:1-2) added their words of judgment to those dabbling in magic and sorcery. Also the New Testament joins the refrain in Acts 8, when Peter condemns a man named Simon who dabbled in magic and offered money to obtain the apostles' power to heal, and in Acts 13:6–12, as Paul condemns a magician name Elymas who was opposing the advance of the gospel. So the whole Bible, Old Testament and New, plainly condemns the kind of astrology, stargazing, and dabbling in the dark arts typical of the magi. 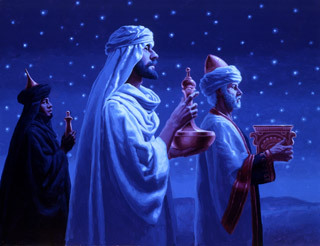 In biblical terms, the magi are plainly marked as "sinners." And Matthew says, "Behold, magi come! Astrologer-magician-sorcerer-pagan-sinners are coming to Jesus." Don't miss the shock of these Jewishly uncouth men coming to Jesus. So, "we three kings of orient" aren't kings, but they are worshipers of Jesus, the true king, the king of all the kings. But even though these magi-wizards aren't technically kings, there is a way in which they point to kings, and to sinners from all the nations, who come to Jesus. Matthew 2:11 provides an important connection between these pagan astrologers and a prophecy from Isaiah. Verse 11: "And going into the house [the magi] saw the child with Mary his mother, and they fell down and worshiped him. Then, opening their treasures, they offered him gifts, gold and frankincense and myrrh." Nations shall come to your light, and kings to the brightness of your rising. Lift up your eyes all around, and see; they all gather together, they come to you; your sons shall come from afar [bearing gifts we traverse far?] . . . The wealth of the nations shall come to you. A multitude of camels shall cover you, the young camels of Midian and Ephah; all those from Sheba shall come. They shall bring gold and frankincense, and shall bring good news, the praises of the Lord. This Christ is not only king of Israel, but he is the king of all nations, the king of kings. Kings are coming to him worship him, and they bring with them their best cultural products and practices and resources — gold, frankincense, and myrrh being just the beginning. The nations bring their gifts. And the world's kings gladly bow to the king of kings. And not only will the glory of God light the whole kingdom, but the single lamp will be the Lamb — the Lamb who was slain for us. When the magi came to Jerusalem asking, "Where is he who has been born king of the Jews?" little did they know that they were asking for him by the very title that would be written above his head as he hung on the cross dying for sins not his own: "the king of the Jews" (Matthew 27:37). This true king of the Jews is not the usurping king, like Herod, abusing power, acting impulsively, employing deceit to bolster his crushing grip on the throats of his subjects. Rather, this king of the Jews is the one true king, the one who "came not to be served but to serve, and to give his life as a ransom for many" (Matthew 20:28), the one who doesn't merely demand our homage but wins it in his shocking self-giving on our behalf — all the way to death, even death on a cross. He is the king who demonstrates his love for his people in that while they are still sinners — while we are still stargazing in our astrology and wizardry — he dies for us (Romans 5:8). This side of the cross we know more than the magi knew. Not only would this God graciously draw Gentile sinners and amazingly permit them to come near to his Son, but he would provide eternal salvation for astrologer-sinners like them, and like us, through the willing death of that very baby they came to honor.